“After you finished my webpage optimization there is only one thing I regret..
THAT I DID NOT DO IT MUCH EARLIER! Every second day some inquiry is coming in, not all of them are useful, but some are! I am very confident to get now some first small orders through this! 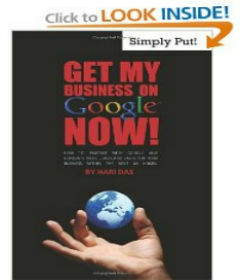 "I owe Hari huge thanks for showing me the potential of blogging in marketing and consumer relationship. By freely sharing, openly discussing and using good examples, I could see he is clearly passionate about helping people move forward and succeed in the social network landscape. His talk inspired me to create my new blog to promote my own passion in the subject of Creativity and Innovation and how to share it more with people out there. There's no going back now, but a lot more to embrace in future. Thanks for showing me the way, Hari. You're a gem." "I was initially skeptical that Cash Cow Consulting would be any different from everyone else, but wow--They delivered what they promised and I now get a lot of value out of my web presence. Their prices are very competitive too." I don't believe Google News has accepted us as part of their news source! That is an awesome distinction for us. Thanks for all the advice and consultation provided during this process. Above all, thanks for being hands on and implementing the whole package. I would highly recommend your services. I want to thank your team and you for helping us achieve top ranking in all the 3 major search engines. We have had many new students joining us after they found us from the web. Also, we are getting enquiries from places outside of Singapore as well. Great Job Hari! Cheers! WOW! Since you took over our online marketing portfolio, our business has been bombarded with increased business. So much so we are facing a shortage of supply. It's a happy problem. I want thank you sincerely for opening my eyes to this possibility online. Yes I notice that the stuff you have done is fantastic. I have cut down about 60% of our adwords. I will be tweaking in as we go along and may stop altogether. Your team has done a wonderful job. Thanks Hari.